Home » Latest News » Gourmet Pizza Night for Timor! Gourmet Pizza Night for Timor! 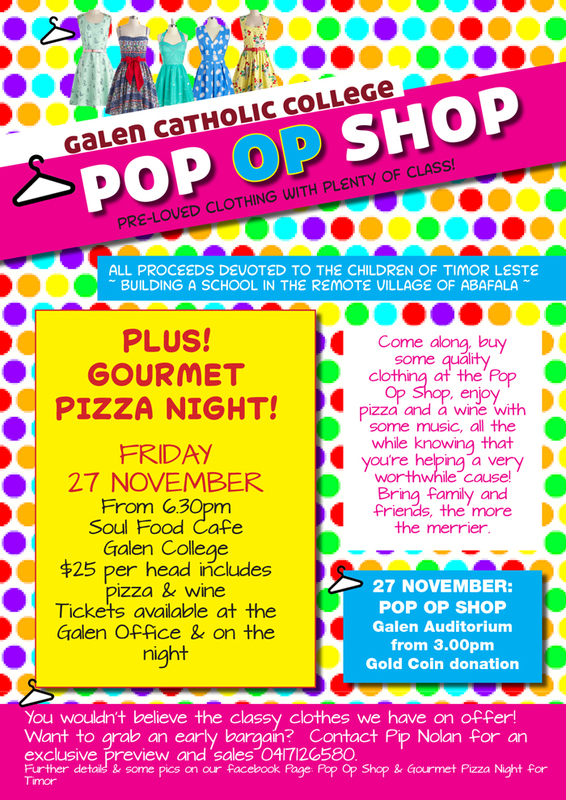 Make sure you come along to Galen’s Gourmet Pizza Night for Timor on the 27th of November. At just $25 per head, including pizza and wine, all funds will go to a very worthy cause; rebuilding a school for the children of Timor Leste in the remote village of Abafala. Tickets are available at the Galen Office and on the night. Also on the 27th of November, starting from 3.00pm at the Galen Auditorium, you can op-shop until you drop! Come along and buy some quality clothing, while knowing that you’re helping our friends in Timor. Bring the family and friends, the more the merrier!